The LOHASIAN: Spirituality for Dummies...and the "Rest of Us"
Spirituality for Dummies...and the "Rest of Us"
Well, its official, "spirituality" has become stuff of pop culture. 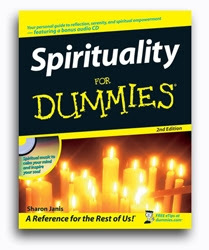 It was just announced by the folks that deliver the "For Dummies" series , have just released "Spirituality for Dummies." The assumption is that being spiritual is clearly a "booming market" and as we need a guide for this - a guide we shall get...and no less - one marketed for "dummies." Geared toward the "spiritually challenged" - the For Dummies book is scribed by Sharon Janis. Janis whose background ranges from studies in Neuroscience to a decade of monastic life to a career as editor, director and producer for TV and film, the writer offers insights into connecting with your higher self. The guide takes the same tone as the rest of the series - humorous and edgy and marries anecdotes, how-to's, stories and quotes to deliver a smorgasbord of peeks into embarking on a spiritual life. The book even provides a complimentary CD with inspiring Gregorian chanting, Jewish Prayers, Christian songs, Hindu Chants and Latin hymns amongst others. Probably not a life changing read, Spirituality for Dummies is the Cliff Notes guide to your soul - or as the creators coin "spirituality for the rest of us." If anything, the book will hopefully provide a great introductory read inspiring further, and more substantial, inquiry on the subject. Coming to stores January 22, 2008...today. I recently saw one of this series titled "Confidence Building for Dummies." Talk about creating a market.